The study of CPA course in USA is also a great career field for international students of any country. Many students are looking for whether to do CPA course in USA/CA course in USA or not. The full form of CPA is Certified Public Accountant and it is a professional designation to present expertize among all accountants in the US. First of all, you all need to know about what is CPA, the exam requirements for CPA Course, & the benefits of becoming a CPA. Let's start to understand one by one by discussing following all about CPA Course in USA. As above said CPA stands for Certified Public Accountant, is a qualification achieved for accountants in the USA who ever pass the CPA examination like CA Chartered Accountant in India. The CPA examination held by The American Institute of Certified Public Accountant (AICPA). To become a CPA in the US, any eligible student must have to pass the CPA examination. Also, requires other things like gain some work experience or related to further education. The CPA accountants must hold licenses to provide accounting services to any of general person. The CPA course is taken very sincerely to maintain knowledgeable accounts and only that can qualify further. Any international students who want to become skillful in accounting and succeed the CPA post will first necessary to pass a CPA examination. The exam is not easy to clear and many tests to know important accounting principles. The exam is called the Uniform CPA exam, and the eligibility to actually take the exam depends on the exact state the student plans to test in. There are three main requirements for taking the CPA Exam. They are categorized as the 3 E’s: Exam, Education, and experience. One of the main qualifications to sit for the exam is advanced education. Undergraduate degrees carry 120 credit hours. The CPA exam usually requires 150 credit hours. This means students will have to achieve 30 hours of graduate level coursework. It most cases, an international student will take the 30 extra hours and then complete a few extra classes to earn a master’s degree in accounting. The exam also tests some of the laws of the state including contract and state laws and often tests the knowledge of federal laws as well. The third requirement to sit for the exam is usually some type of experience in the field of accounting. While not mandatory in all states, some states require that a CPA candidate have 2 years of work experience in accounting or tax preparation. Some states only require general experience in accounting. There are many benefits to becoming a CPA or Certified Public Accountants in the US. Any student who interesting in an accounting career can choose a CPA course which is necessary to pass & become a qualified CPA. Those who are successfully become a CPA, he/she can get paid high as compared to other courses. CPA in the US has a lot of work and responsibilities as being top of the professional field in which anyone feels great while working. An international student are interested in studying accounting & wants to become a CPA with graduating accounting degree will achieve their dream and a good career. 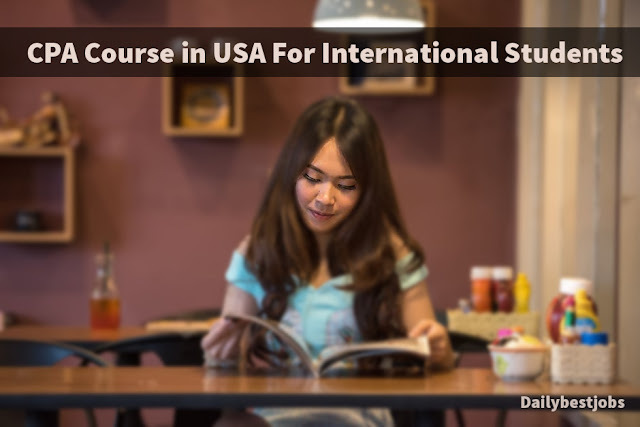 Hope you are good to know about CPA Course in USA For International Students, Share it with your friends and subscribe below for future posts related to CPA course. nice post, this will guide me to choose CPA Course in USA for International Students. Thanks for sharing, looking forward more like this.